Let’s wrap up non-fiction week, here @ heatherfromthegrove, with a little humor. There’s nothing like a little hedonism on a hot summer day. Endangered Pleasures is an unabashed and irreverent ode to self-indulgence. In defense of small vices and taking time to smell the roses, the late Barbara Holland reminds us that we should loosen our ties, kick off our shoes and… live a little bit. Have some fun. If only Barbara Holland had met someone like Alexis Zorba (Zorba the Greek)… they would have shared quite a few dances together! This beautifully written book contains essays that extol every simple, little joy – from waking up in the morning to padding barefoot around the house and yard. Holland’s wry sense of humor comes through, loud and clear, making us realize that sometimes we take ourselves way too seriously. I’m so happy that I came across this book, but sad that the author has since passed away. 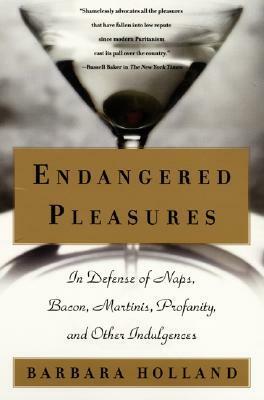 Endangered Pleasures is a great summer read, so kick off your shoes, pour yourself a glass of something and have a good chuckle. Life’s too short. This entry was posted in heatherfromthegrove, inspiration, lessons learned, literati, non-fiction, other musings, writer witticisms and tagged Alexis Zorba, Barbara Holland, barefoot, champagne, Endangered Pleasures, entertainment, essays, Heather Joan Marinos, Heather Marinos, heatherfromthegrove, heatherfromthegrove's non-fiction spotlight for today: "Endangered Pleasures: In Defense of Naps Bacon Martinis Profanity and Other Indulgences" by Barbara Holland, hedonisms, humor, indulgences, life is too short, little pleasures, martinis, non-fiction, pleasure, self-indulgence, summer read, vices, Zorba the Greek. Bookmark the permalink.